Its time for Guthuk. This year (2012), ‘nyi-shu-gu’ falls on Monday, February 20, and as our ancestors have done for hundreds of years, I hope that you and your loved ones will gather for Guthuk, perform the rituals for driving out all negative forces of the old year, and let the Lue carry them away. I have posted a simple guthuk recipe is below. But first, I would like to share a guest post from – Surkhang Jampa Yangchen la, who posted this complete and wonderful writing on Guthuk on her Facebook page. I thank her for allowing me to share it here. It is the most complete and detailed that I’ve seen anywhere so please enjoy reading it. And for your information, the word is that Yangchen la has a Tibetan Cookbook in the works – I hope it will happen soon . Are you ready for Guthuk, the special Thukpa that we Tibetans eat on the 29th day of the 12th month of the Tibetan Lunar calendar? This year it falls on February 20th. Eating Guthuk on this particular night is very important as the tradition that accompanies it signifies our safe passage into the New Year. That we cleanse ourselves and our living spaces of all the obstacles and negativities of the past year, is an important part of observing that tradition. 1.Meat 2.Flour 3.Crushed barley 4.Radish 5.Dry or fresh peas 6.A dash of dry fenugreek leaves (shopsi) 7.Salt 8.Pepper 9.A dash of coarse dry Tibetan cheese flakes. Except for some of these extra ingredients, Guthuk is prepared in the same way as Bakthuk, theThukpa that is prepared and eaten on Ganden Ngamchoe, the death anniversary of Je-Tsongapa. As such, Bakthuk is always associated with mourning and it is not to be confused with Gutsi-Rithuk. The difference lies in the shape of the dough. Bakthuk is a small marble sized dough squeezed between your thumb, forefinger, and middle finger, whereas Gutsi-Rithuk is shell shaped. The most outstanding characteristic of Guthuk and perhaps a unique practice that adds a flavor of playful fun to this occasion is the custom of adding dough-balls to the dish. One might think of them as a rendition of the modern day fortune cookie. These large dough balls that clearly stand out amongst the rest contains a small rolled up piece of paper at their center and on these pieces of paper are written certain words that stand as metaphors for certain human characteristic, both positive and negative. In most circumstances, having Guthuk is a family affair and as each family member sits around the steaming pot, a dough-ball is served along with the Guthuk. Each dough-ball revelation or “divination” (for the sake of sounding mystical) is said to represent the innate disposition of the person. Some of my friends in the West humorously refer to these dough-balls as “The Oracle Dough”. Of course we all take these predictions with great deal of fun and laughter, but if you really believe you possess that character, especially when it is negative, then it is an opportunity for you to reflect and leave that trait behind with the old year! According to the custom associated with this day, each person must eat 9 servings of the Guthuk. This is possible only if you have a large appetite or if you take small servings. At the end of the 9th bowl, one should not finish it completely but rather leave a little leftover in the bowl. Everyone’s leftover is then emptied into a broken or a cracked container. Following this, each person is handed a piece of dough the size of a ping-pong ball called Pagchi, which literally means a dough-cleanser. The Pagchi is then squeezed in either one of your hands, while making sure that your fingers are imprinted on it. These imprints represent your whole body. The Pagchi, while still squeezed, is then skimmed over different parts of the body, particularly touching areas where you have pain or other discomforts due to sickness. It is believed that doing this takes away your pain and ailments and absorbs them into thePagchi. When this is completed, the Pagchi, is thrown into the broken or cracked container. At the same time, you can throw a strand of your hair, a thread from your clothes etc., into this container. Finally, a small human effigy made out of dough called Lue (signifying an evil entity) is placed in the center of this container. Once this ritual is complete, no visitors should enter your house this night, nor should ladies wash their hair. I know customs differ from region to region and even from household to household, if you have something new to add, I’d love to learn, please let me know. Dough: Start by making the dough, adding water little at a time. You want to make sure that the dough is firm and strong, so don’t add a lot of water right from the beginning as it is easy to add too much. Cover and let stand while you prepare the stock for the thukpa. Broth: In a large pot, heat 2 Tablespoon of oil, swish it around and let it coat the pot well. Add chopped onion and minced ginger. Once the onion turns golden, add garlic, stir it once, letting the garlic aroma develop and then add the meat – add a dash of salt, pepper, emma. Let the meat brown, then add the Labu (daikon) – and soya sauce. 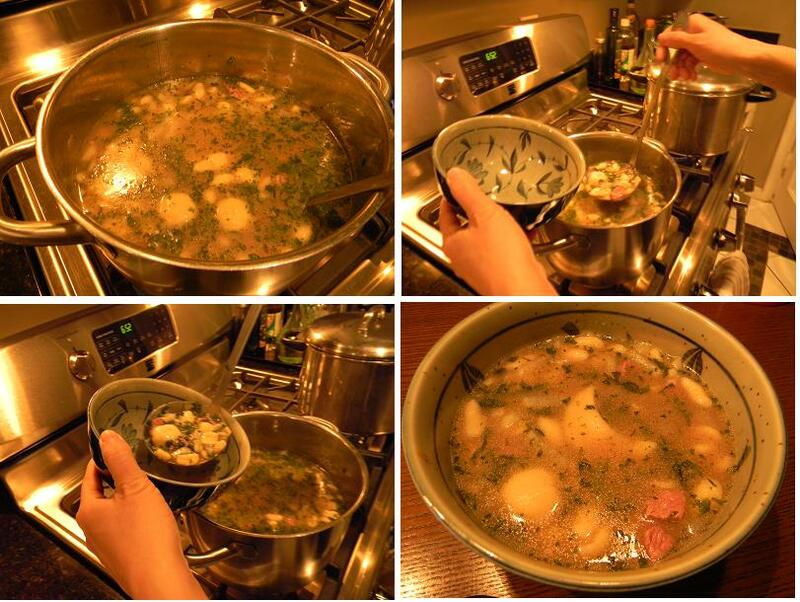 Stir it, let cook for a minute or two – and then add the Beef Stock (or water if you don’t have any stock.) 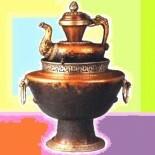 Bring to a boil and then let simmer while you prepare the thukpa. Bhak-thuk: Knead the dough well. Divide it into manageable portions. (Leave aside one portion for Guthuk Balls, Pak-tsi and Lue). Now, taking one portion, roll it into a long thin dough – you can roll it between your palms or on a flat floured surface – and then you start making your pasta by pinching off little pieces from the end and rolling them between your fingers into a round shaped dough. 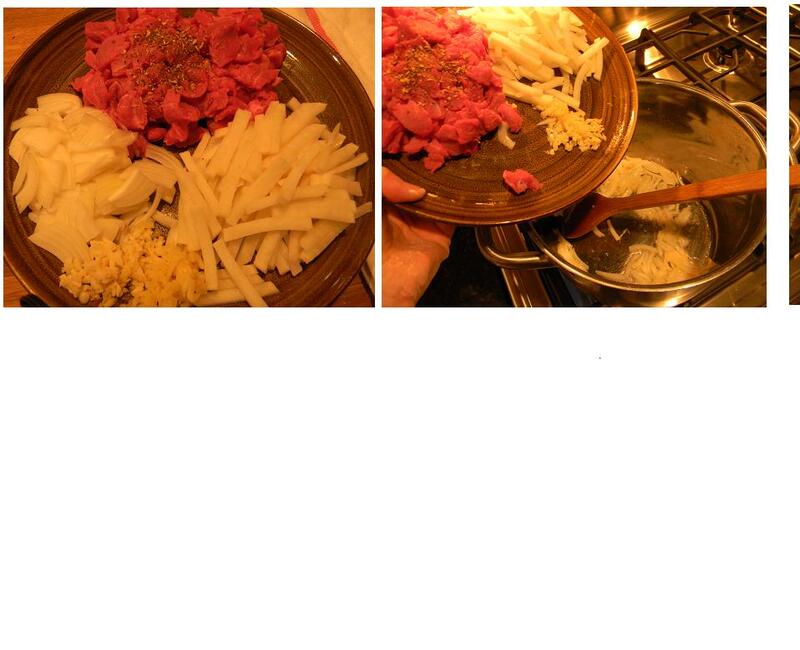 (Gutse Rithuk is also made like this except the pasta if pressed in a curling motion with your thumb on the palm of your hand – forming a shell-like pasta). I sprinkle a little tsampa on the pasta to stop them from sticking to each other (if you don’t have tsampa, just use flour instead). Dough Balls: Next, time to make the Guthuk Dough Balls. Prepare all the ingredients or write them on paper as Yangchen la suggests. Divide your dough into enough pieces so you have one Ball for every member of your dinner party. Flatten out the ball, add the ingredient and then close it up and roll it into a ball shape. These dough balls will be much bigger than your pasta and easily distinguishable in the pot. Guthuk: Add the dough balls into the thukpa broth – they take a little longer to cook through (You don’t eat them but they are easier to cut open when cooked). Then add all your rolled pasta to the thukpa soup, stir the pot so the pasta pieces separate – make sure you have enough broth and let pasta cook through. Once pasta is cooked, add spinach, turn off the fire, cover the pot and let stand for 5 minutes. Your thukpa is ready to be served and enjoyed ! Nye-po Nang-go and wish you well. Thank you so much Simply Tibetan for helping to preserve and promote traditional Tibetan cuisine. I have shared your link on Great Himalaya Foods Facebook page with regard to Gu-Thuk. Do you have a Tsam-Thuk recipe to share with us, or any other traditional ways to prepare tsampa other than our usual Cham-dur or Pha recipe? Thank you! i am going to do shopping for guthuk today ! How do you do when you’re vegetarian? 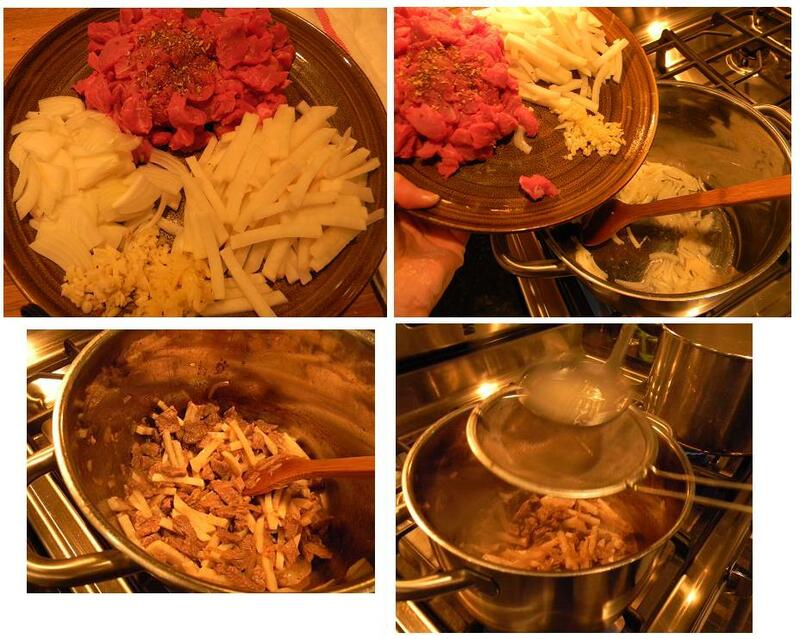 This entry was posted on February 19, 2012 by simplytibetan in Recipes and tagged Bakthuk, Guthuk, Gutor, losar, thukpa, Tibet pasta, Tibetan New Year, tibetan pasta.